Voice communication has become an essential part of multiplayer gaming, from professional e-sports to guilds in World of Warcraft, video gamers and friends who play shooters or strategy games in the evening. PC gamers basically have the choice between three different types of voice communication applications. First those that are implemented directly in a game, then third party software that uses client and server communication, and finally software that requires only a client. RaidCall belongs to the third group, as users only need to install the client software to use the voice communication software. That's different from comparable solutions such as Teamspeak or Ventrilo which both require a server running the server software before they can be used. RaidCall clients communicate directly with a master server that transfers the data to the connected clients. Because of this, it supports up to 1000 clients per channel. The number of clients per server is however limited to 30 at this moment. It can be increased by inviting new users. Each new user increases the limit by one. 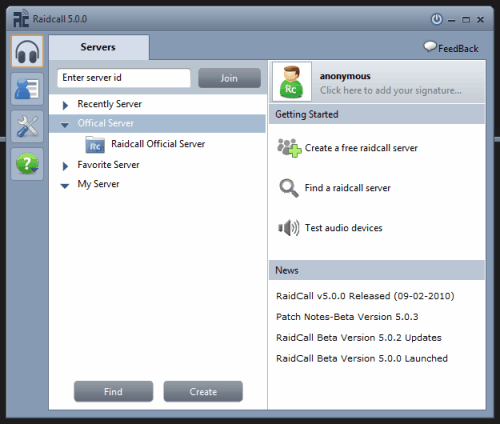 Users can log in anonymously to start chatting right away, or create a free account which is required to create a free Raidcall server and use the friend's list for basic social networking features. One interesting feature of Raidcall is the ability to display an overlay control window whenever it is needed. Raidcall uses less resources than Teamspeak, the only other voice communication software we had installed on our test server. The software used about 27 Megabytes of RAM while running on the 64-bit test system, compared to the 40 Megabytes of Teamspeak. The audio quality was okay. One negative aspect compared to Teamspeak was the missing option to change the audio codec, to accommodate for lower or higher bandwidth groups. RaidCall is an interesting alternative, considering that it does not require a rented or hosted server to communicate in groups. The voice communication software is available for download at the developer site.